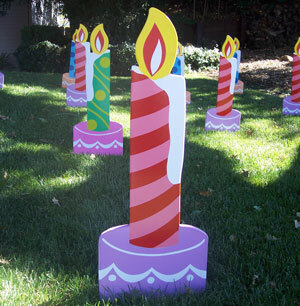 Choose from these fun decorations for your special surprise, or combine two or more for an even more unique display (additional fees may apply). Your personalized message can be up to 4 lines of 12 characters each (including spaces). Can’t think of the perfect thing to say? Some examples are provided below. Get a quote or ask us for more ideas. George, Turning 22 is for the Birds! Gee! Golly! Wow! Javier is 30 now! It’s not about age – it’s about attitude! …And many more! Happy Birthday, Debbie! 18 Cheers for 18 Years! Happy B-day, Ian! Do We Smile or Scream? Jason’s 13! Start Your New Job With a Smile! Congrats! Our Hearts Go Out to Mary! She’s 45! Happy B-day to the world’s best mom! It’s Udderly Nifty – Barbara is 50! Holy Cow, We Herd Bob’s 42 Now! To a Dino-mite Kid, Happy 6th B-day! Larry’s Almost Old Enough to be Oil! Our little princess is turning 5! Hear ye, hear ye! it’s Beth’s 10th birthday! Grin and Bear It! Happy 50th, Sandy! We’re full of elation for Mark’s graduation! We are happy to say Hillary graduation today! A new journey begins! Congrats, Jim!